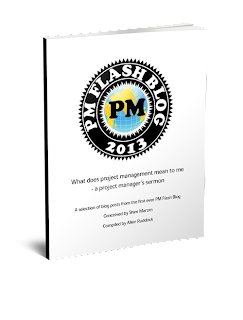 Musings on project management: It's agile! Why plan? Why schedule? Why estimate? Remember the Trinity of Estimation? Why plan, why schedule? Indeed, the question might even be: Why estimate? It’s all going to change anyway. If there are no plans, any outcome is acceptable; if there are no plans, there is nothing to estimate; without estimates, there is no reason to measure. Without measurements, there will be no benchmarks, no improvement, and no answer to the questions of where are we? And, oh by the way, what are we doing? Trust them to get the job done. I say, what job is that? It is the job described in the business plan, if you have one, but what if you don't? It is the job estimated and scheduled? Ooops, no estimates? It is the job as interpreted in near real-time by the functional user? It is the job that evolves over several iterations and is adapted to the emergent value proposition? And, where is it we are going with that? Trust them to get the job done. What is the definition of done? Is it done when time/money runs out? Is it done when the backlog is fully exhausted? If you are trying to do a project without management, good luck to you.